Olivier Giroud gave his side the lead just after half-time, before an Alvaro Morata goal in the 82nd minute made sure of the victory. Chelsea's Olivier Giroud celebrates scoring his side's first goal of the game. 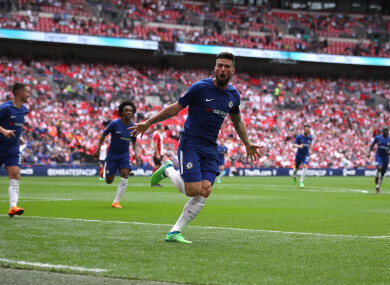 CHELSEA BOOKED AN FA Cup final showdown with Manchester United as Olivier Giroud tormented Southampton again with a sublime strike in Sunday’s 2-0 win at Wembley. Giroud has made a habit of scoring against Southampton and the France forward was their nemesis in a one-sided semi-final. Opting to select Giroud instead of Alvaro Morata proved a shrewd move by Chelsea manager Antonio Conte as the former Arsenal star produced a tremendous piece of skill to break the deadlock early in the second half. Giroud has feasted on Southampton this season, scoring twice to spark Chelsea’s 3-2 win last weekend and also netting a late equaliser against them for Arsenal in December. His fourth goal for Chelsea since his January signing was followed by a late header from substitute Morata, setting up a heavyweight final against United at Wembley on May 19. That will be Chelsea’s last chance to win major silverware at the end of a troubled season. Chelsea’s 13th FA Cup final appearance will be a repeat of the 2007 showpiece, when Jose Mourinho’s men won 1-0. The Blues, back in the final after losing to Arsenal in May, last won the competition in 2012 and are bidding to lift the trophy for the eighth time. Winning the FA Cup might not be enough to convince either Conte or Chelsea owner Roman Abramovich that their two-year partnership should be extended. Conte has spent much of the season complaining about Chelsea’s failure to back his transfer plans, while several of his players are believed to be unhappy with his demanding training sessions and intense personality. The Blues face a tough task to qualify for the Champions League via a top four finish in the Premier League as they trail fourth placed Tottenham by five points. Against that backdrop, winning the Cup would at least provide an uplifting conclusion to a frustrating campaign. For Southampton, the focus returns to their desperate battle to avoid relegation, with just four games left to climb out of the bottom three. There were a significant number of empty seats in the Southampton end of the stadium and the stay-away fans were vindicated by their struggling team’s lacklustre display. They had little chance of a famous Cup upset with Eden Hazard at his stylish best. Hazard threatened with a fierce strike that flashed just over from 25 yards. Then the Belgian embarked on a surging run from deep in his own half before slipping a pin-point pass to Willian, who cut back inside and blasted against the crossbar. Giroud was warming to the task of giving Southampton another headache and he went close to breaking the deadlock with an acrobatic volley before half-time. Chelsea’s dominance was finally rewarded in the 46th minute. Cesc Fabregas lofted a pass towards Hazard and he controlled brilliantly in mid-air before slipping the ball through to Giroud. There was still work for Giroud to do and he side-stepped three defenders with surprising grace, his nimble foot-work giving him just enough space to slot home from close-range. Hazard was virtually unstoppable and he scythed through again before curling just wide. Southampton’s Charlie Austin appealed in vain for a penalty after Giroud left his arm out to block the forward’s header. Finally coming out of their shell, Mark Hughes’ side almost drew level when Nathan Redmond’s long-range drive was pushed away by Caballero. Morata, who has failed to impress since his move from Real Madrid last year, was furious after being hauled off at Burnley. Just days later, he was all smiles when he nodded home from Cesar Azpilicueta’s 82nd minute cross. Email “Chelsea will face Man United in the FA Cup final after defeating Southampton”. Feedback on “Chelsea will face Man United in the FA Cup final after defeating Southampton”.